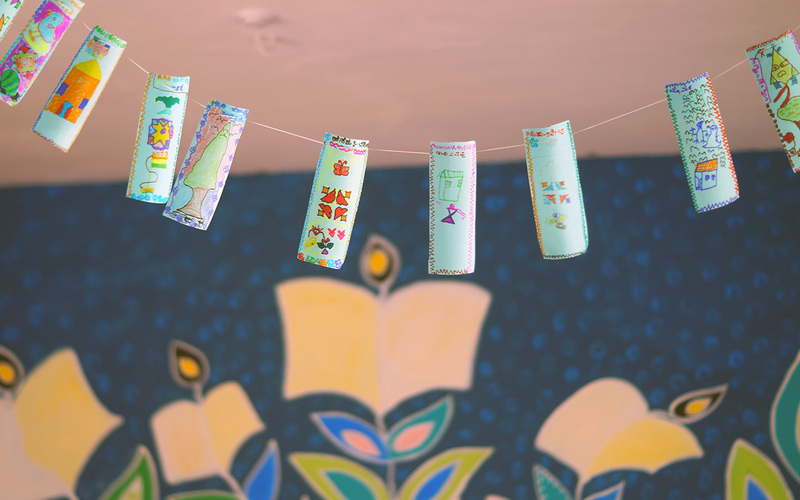 Bookmarks made by children as part of a book extension activity are displayed. 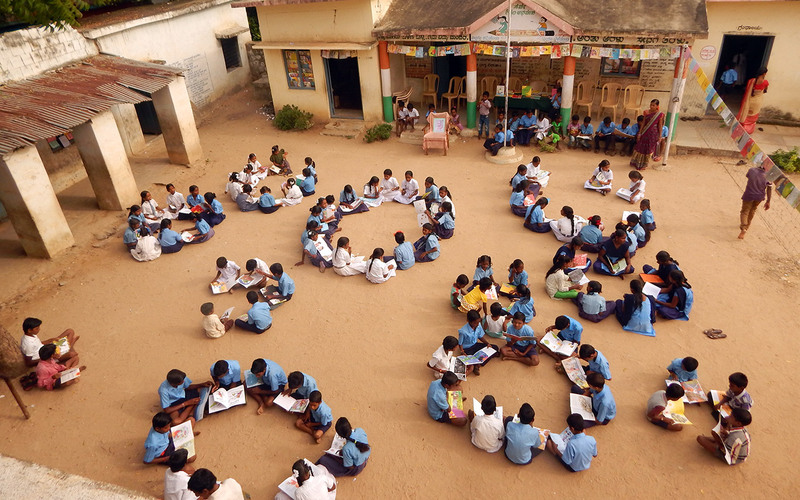 Two years after Parag set up 40 school libraries in Gurmetkal block of Yadgir district in Karnataka, the libraries have brought children closer to books. 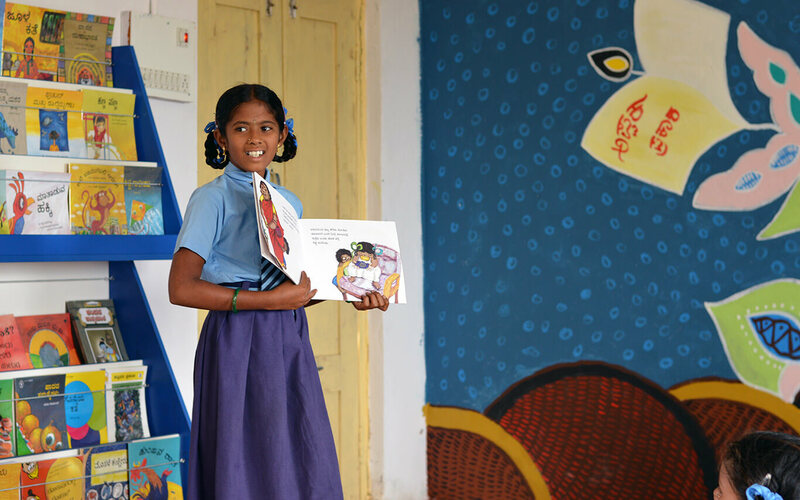 The libraries, set up in partnership with Kalike, an associate organisation of Tata Trusts, have also impacted several other stakeholders. They have given the facilitators the confidence to grow as library professionals and they have become integral part of school education. 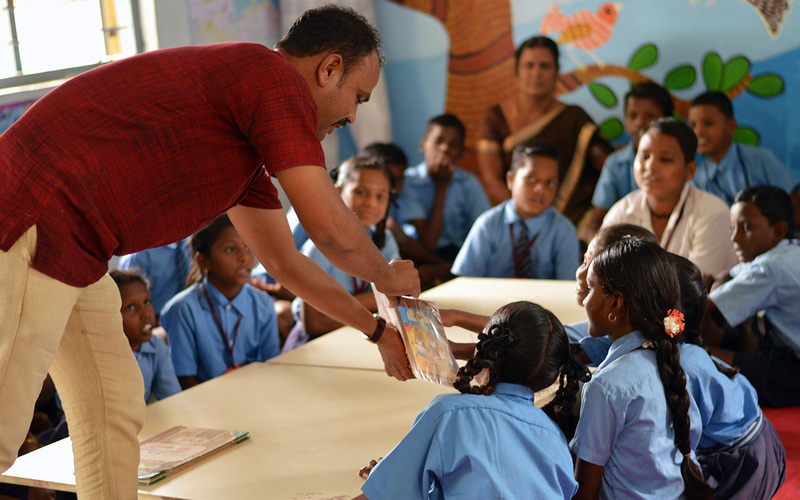 At the Nazrapur school on a rainy morning in July, I ask a group of children gathered around me what more they would bring to their library if they had the chance. There is silence before one child sitting at the back says — his long-lashed eyes wide and serious — “More books. New books”. It is also clear that the children have learnt to pay close attention to the books. When a library facilitator tells a story, he introduces the title, its author, its illustrator, and (in most cases) its translator. When a child gives a book talk or shares a book with her peers, she follows the same pattern. These habits help develop a rounded understanding of the object of a book—the processes and people and languages that go into its production. The students are also involved in covering their library books in plastic wrapping; they are given demonstrations on how to treat the books with care (indeed none of the books in the Parag- Kalike Libraries bare any marks of ill treatment). The result is that the children have a fairly complex grasp over the object of a book, from the moment of its creation to the manner in which it should be consumed. There is uniformly something empowering about the library space for all its participants. For the students, the most significant change is in their levels of confidence. 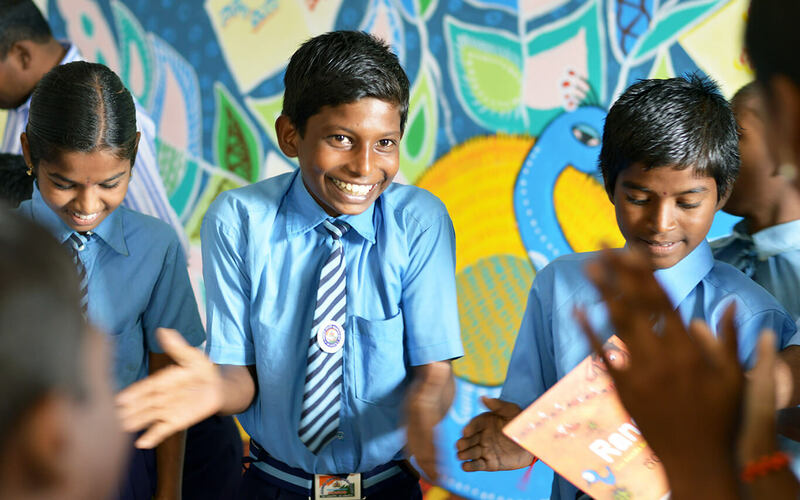 Chowdamma of the Minaspur library voices this most explicitly: they are children who have shed their inhibitions, become comfortable with their own methods of expression. She sees this as having come about because so many of the library activities involve the children putting down their own thoughts about the books they read, or composing their own stories in their language of choice, scribbling on swathes of chart paper in whatever manner they please. And what is important is that their work is validated—put up as display on the walls of the library and later, filed away for safekeeping. When giving book talks or conducting storytelling, the child is given the chance to speak before a captive and appreciative audience. Their demeanour during the task reflects their comfort—their voices grow louder, they hold the pages of their books wide open, they make eye contact. Student agency is actively encouraged, and the children have begun to have faith in their own creative abilities. A student shares a book she enjoyed through a Book Talk. 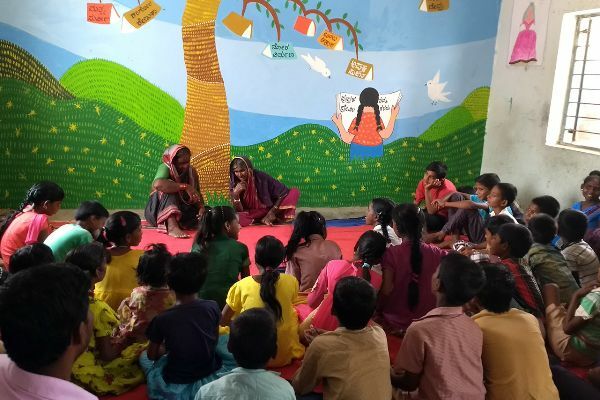 Another aspect of the intervention that will doubtless have a deep impact for the children is the extent to which it encourages them to take ownership of their own libraries. 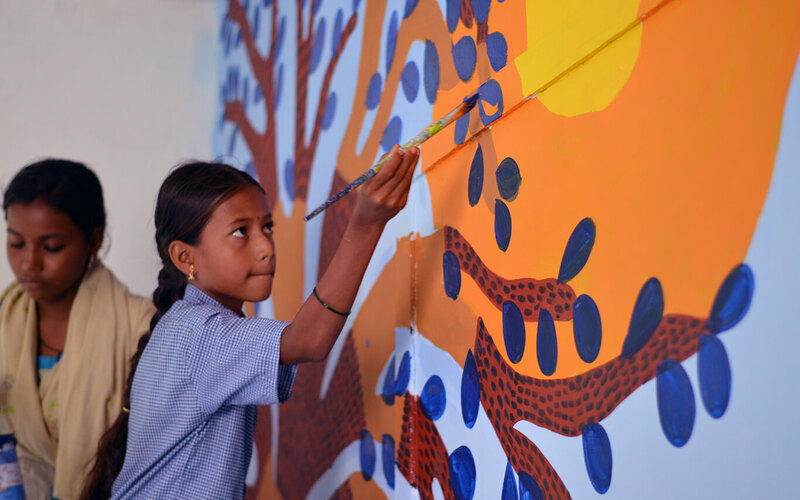 For instance, the artwork on the walls has been painted in collaboration with the students, and when asked about it, they are quick to run over to the wall and point out which sections they painted. They like that their contribution was both useful and decorative, that they were trusted with the kind of responsibility that their parents and teachers normally keep out of their reach. This, and other little tasks, like book repair, or the fact that they see their own paper flowers and crayon sketches adorning even the plain lime washed walls gives them the sense that the space belongs to them, that it is with their participation that the library is made both beautiful and functional. A student paints a library wall as part of collaborative art to make the library space vibrant. 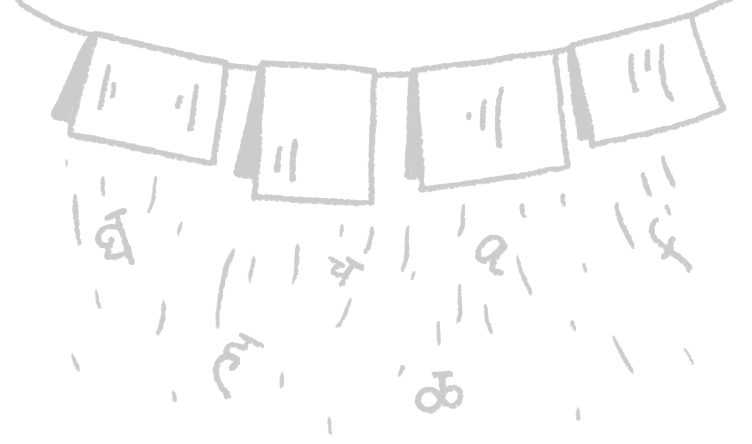 A significant challenge for animators is dealing with the variations in reading ability within the student group. Some children enter the library space almost completely devoid of the ability to read (so much so that the first thing most children say when asked about learnings from books is “we learn to read fast-fast”). Such children teeter on the brink of being non-readers all their lives, if not engaged effectively during these crucial years. 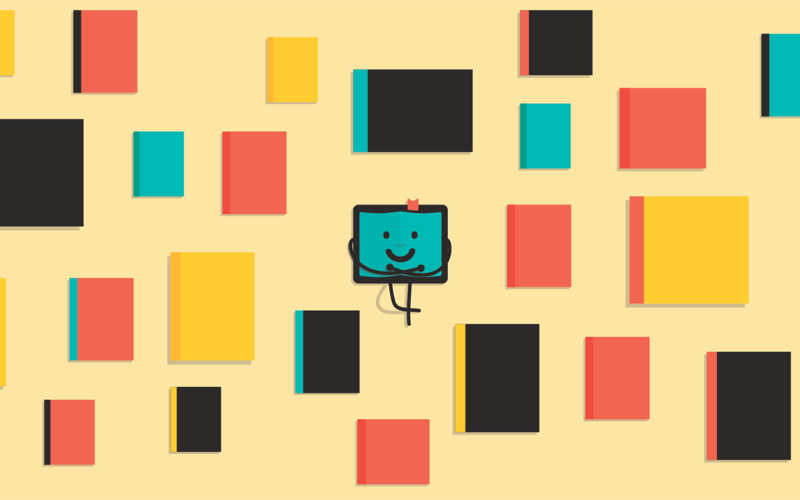 That librarians across this set of schools have developed different strategies for tackling such problems is evidence of how they take charge of the library space, and that they trust their own judgement in these matters. Some prefer to allow children to take texts in through the illustrations till their reading skills are brought to fluency, while others read aloud with them, and still others leave children to read alone, however slowly and ask when they have doubts. On the whole, while their understanding of the role of the librarian in the library and the library in the school and the community has deepened, this has not reached a point where they can articulate fully their beliefs about the space. But they all harbour a growing conviction that they, as individuals, can play a part in determining how these elements interact. A Read Aloud engages students during a library session. 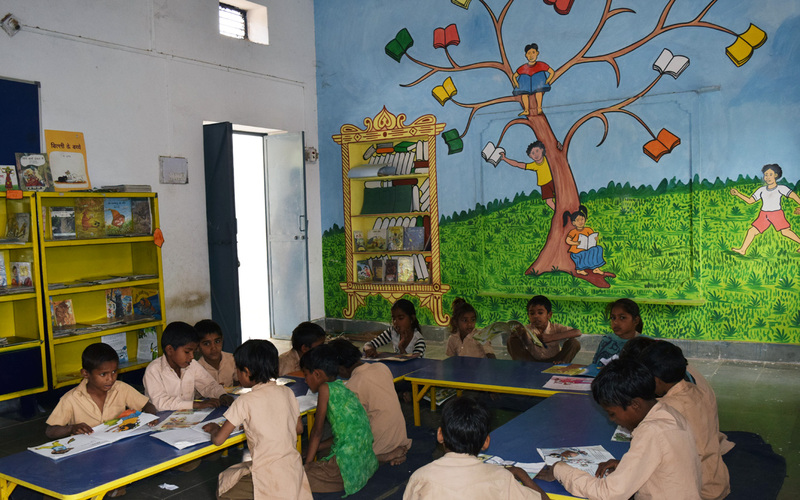 The most discernible impact of the intervention from the point of view of the schools is the acknowledgement of the library as a learning space. Principals refer to the libraries as spaces for expanding “knowledge.” To some this means a wider range of ideas to encounter, to others it means that existing knowledge can acquire depth (“Books can tell us about our past” is an oft repeated statement, and a reference to the book Mukand and Riyaz and the historical context of the Partition in the session at Buduru illustrates the truth of this). But the implication is that the libraries are helping push the boundaries of what it means to learn in these schools. Classrooms are no longer the only legitimate point of transacting knowledge. The library will slowly take on the roles of both supplement and alternative. The fascination with books has spilled over into the classrooms. There are reports of a new trickling phenomenon—subject teachers sending their students to the library to do reference work. The ways in which the library can be used as a classroom resource have perhaps not all been realised, but the space is certainly on its way to being recognised for the avenues of thought it opens up. 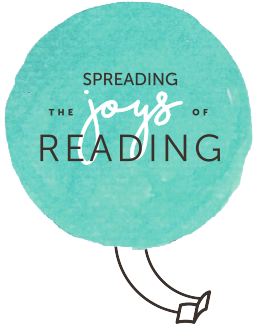 And a final mark of the infectious nature of the library bug is that other teachers borrow books too, to share with their classes, or simply take home and enjoy with their own children! As part of National Library Day celebration, students turn an open space into reading space.